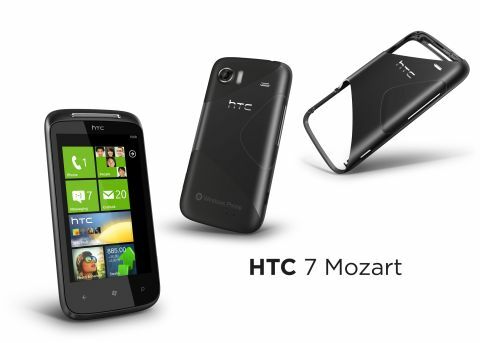 The HTC 7 Mozart is a high quality Windows Phone 7 handset, but often feels restricted by the software. The HTC 7 Mozart is one of three Windows Phone 7 launch handsets from the Taiwanese company, offering a surround-sound experience for video and music playback from your humble handset. The 1GHz processor also powers a 3.7-inch WVGA screen, an eight-megapixel camera with Xenon flash and 720p HD video recording as well as all 3G and Wi-Fi connectivity for speedy web browsing. There isn't a great deal between the launch handsets for the new operating system, given Microsoft's strict control of the software and stringent minimum hardware specifications. But what sets the HTC 7 Mozart apart from other HTC handsets such as the HTC HD7 and HTC 7 Trophy? Well, the HTC 7 Mozart has a focus on high fidelity audio, and as such it offers virtual surround-sound in the form of SRS WOW HD. This audio enhancement makes the sound seem wider, even when wearing headphones, provides more realistic bass and clearer definition to the sound you hear. The HTC 7 Mozart is also a little smaller than the HTC 7 Trophy and HTC HD7, but offers a better camera (eight megapixels to the others' five megapixels). All offer the same 8GB of internal memory – there's no hot-swappable storage on any Windows Phone 7 handsets so you can't expand that 8GB. This lack of external storage puts HTC 7 Mozart users in the same boat as iPhone owners, although the iPhone 4 offers a lot more memory for your money these days. Obviously the HTC 7 Mozart doesn't offer the freedom of its Android-toting brethren, the HTC Desire HD and Google Nexus One, in this respect. The back panel is a bit busy. Not only do we have the camera lens and Xenon flash, but also a small external speaker (often mistaken for the micro-USB charging port), the Orange, HTC and Windows Phone logos, as well as HTC's stylistic elements – triangular rubberized top and bottom segments with the body of the handset built from a piece of brushed aluminium. There's a lot going on back there. On the front, the HTC 7 Mozart has the familiar Windows-specific buttons laid into the panel – Back, Menu and Search. It's all very smart and serious. Aside from these embedded buttons, there's also a camera shutter button and volume control on the rounded sides, and a lock-screen/power button on the top of the handset. Alongside this is the 3.5mm headphone jack. Overall, the HTC 7 Mozart is a slim, lightweight handset. Despite this, it feels well put together and the brushed aluminium gives it a sturdy feel. Although the HTC 7 Mozart has neither the super-sized screen of O2's HTC HD7 nor the Super AMOLED goodness of the Samsung Omnia 7, its 3.7-inch WVGA display holds its own in terms of brightness and crisp graphics.